Ah, Valentine’s Day – the day that should celebrate love, but for many of us, it’s the day we love to hate. But the best part about the 14th this year is that, whether single or taken, curling up with 9-time Oscar nominated film The Grand Budapest Hotel is probably your best option for avoiding a depressing day. Did your significant other let you down? Wes Anderson’s array of boisterous colors won’t. Feeling all alone? Never fear – grab your vino and a Mendl’s-inspired pastry and spend 100 minutes falling in love with the Republic of Zubrowka. 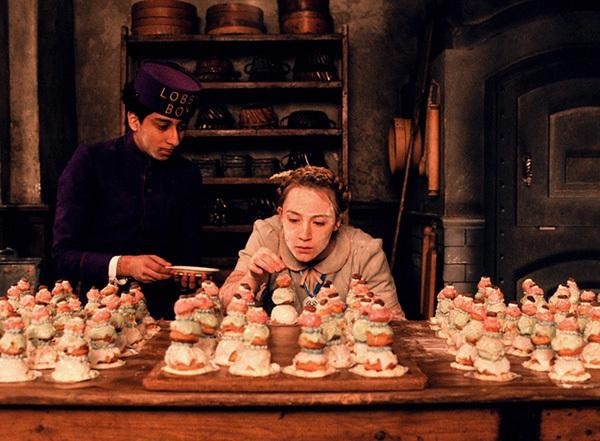 Mendl’s Bakery was, in fact, involved in one of the major plot points of the movie – which we won’t spoil for anyone who has yet to see this gem – but it was the colors and the delicious-looking assortment of goodies that draw us in. Mendl’s was where Zero’s (our hero’s) love, Agatha, worked. The two lovebirds would meet there for secret rendezvous. The colors of the pastries (and the bakery itself) provided an extra gorgeous backdrop (although it was a somewhat muted one, primarily in pastels) for the rest of the movie. Agatha’s costuming even mimicked the bakery’s colors – a trick the costumer likely employed to make us remember her character. But how could we not remember Saoirse Ronan in that fiercely independent role? Production designer Adam Stockhausen had a big hand in creating the look of Mendl’s Bakery. All of the boxes were handmade, as well as the pastries. Stockhausen states that the location in Dresden, where the Mendl’s scenes were filmed, was a big inspiration for the overall look of the bakery. The actual location was a creamery – not a bakery. It had gorgeous tiled floors, amazing scenery, and a “jewel box”-like quality – a perfect backdrop for secret meetings and activities. Oh, and also for pastry-making. 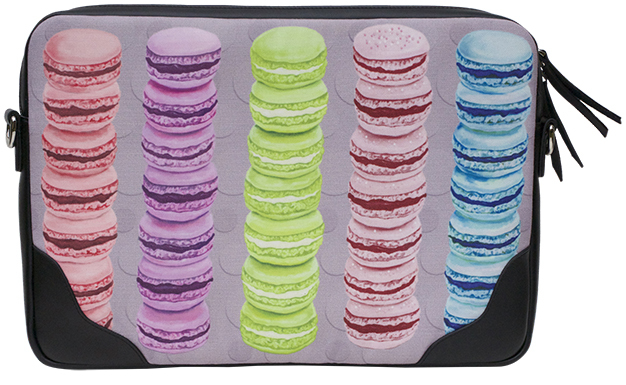 A perfect addition to go along with your Grand Budapest DVD from your honey is one of our Macarons Laptop Bags – so you can carry your laptop stylishly, and watch The Grand Budapest Hotel wherever you may jet off to! There are many pretty designer laptop bags your partner can choose for you this Valentine’s Day, but at PLIA Designs we love a good theme! This bag has a classic silhouette and holds up splendidly against the elements – whether you accidentally drop a Courtesan au Chocolat on it, or have to dash around, running errands on cobblestone streets. It can be used as a clutch, or its designers have lovingly provided a detachable strap to make it a bit easier to carry. The design fits most 15” laptops, and is made of cotton twill with real leather trim. Whatever your plans this Valentine’s Day, make sure you include some time for yourself – loving yourself is just as important as spending time with your sweet! Grab some downtime, some wine, and a good flick (like, for example, maybe the one you’ve been reading about in this article?) and give yourself an at-home mani-pedi. We even give you permission to have an extra cheat day the week of the 14th – go crazy on those half-price chocolates! And enjoy the sweetest treat of all: relaxing with some movie magic.